Jeff Shannon is veteran police officer for the City of Berkeley and a Licensed Marriage Family Therapist. He specializes in mental health-related calls within the police department and he frequently works with police officers as a therapist on issues relating to or stemming from their career in law enforcement. 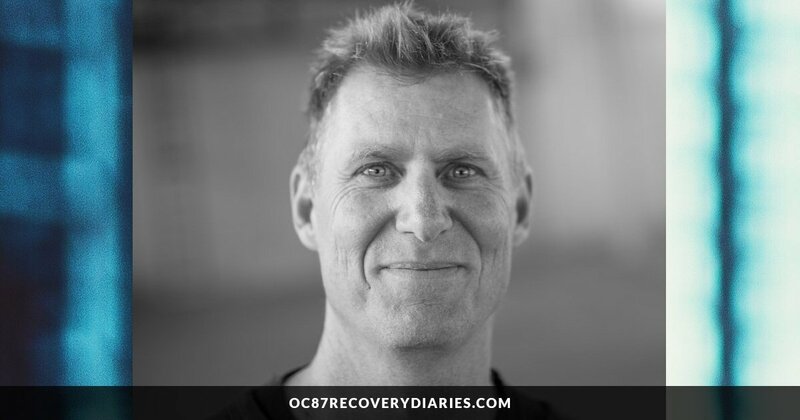 In Part Two of his interview, he talks with OC87 Editor Gabriel Nathan about issues surrounding law enforcement suicide, retired officer suicide and mental health crisis intervention and de-escalation and the overall state of mental health in America. For Part One, please click here. GABRIEL NATHAN: You mentioned about police officers who are experiencing suicidal thoughts and I want to talk to you for a moment about law enforcement suicide. As we discussed, many police officers suffer in silence with their problems due to that machismo culture of policing or that expectation that you have to have all your stuff together and that stiff-upper-lip mentality. I think there’s also a fear in a lot of officers’ minds that if they give voice to what they’re thinking, that they’re going to lose their gun and badge and their identity as a law enforcement officer. It’s so much more than just a job. So, you have that problem and you have constant access to lethal means. So, what can be done and what is being done to prevent law enforcement suicide? JEFF SHANNON: So, I think we start off with this question, “Do police officers kill themselves more than the general population?” It’s really been challenging to get these numbers. One of the reasons this is difficult is that officer suicides are often mis-classified as an accident for the purposes of insurance for their family and so on. So, it has been challenging for researchers to get this answer. I think that the Center for Disease Control looks at incidents at least by per 100,000 people in the population. How many people do this or have had it happen? It looks like we do have a problem with suicide. I think the numbers are about 17 or 18 out of 100,000 officers kill themselves. So, it looks like it is a problem. So, what to do about the problem? Education. Making people aware of the number they can call in case they are feeling suicidal, and, in our department, there is a flyer up on a wall that everyone walks by that has that number to call. Addressing a culture and normalizing it. It’s really a message in terms of the identity is that yes, law enforcement officers are brainwashed: we’re taught that law enforcement is a way of life. It’s not just a career. Another point to make here is that there’s a misperception, I believe, among a lot of law enforcement officers that if they ask for help, they’re going to lose their badge and they’re not going to have a career. That’s absolutely not the case. If, for example, what they’re doing is reaching out for counseling, professional counseling, professional counseling is confidential. The therapists are psychologists who risk losing their license by disclosing personal information they learned in therapy. And a lot of officers, they don’t realize that. They don’t realize that they can seek confidential counseling, EAP (Employee Assistance Programs) are all about that. So part of it is educating officers about the confidentiality of counseling. But the other part of it I have to tell you is that I have found that, often, it seems to me that some officers use that as an excuse for resistance in seeking out help in general. So, just from my own experience talking to officers, sometimes, it feels like that’s just something they’re clinging onto so they can avoid taking a look at what’s going on. 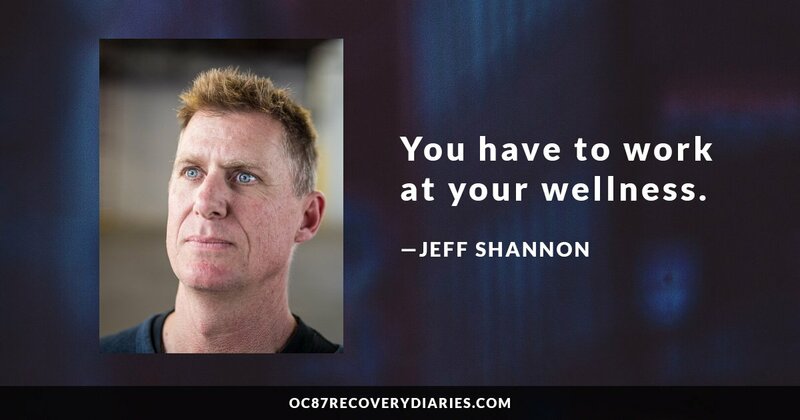 JEFF SHANNON: Here’s a situation where you have individual officers and the way they cope with stress and their own resilience. Some officers get to retirement and they transition very well. They have maybe another second career they’re doing or they’ve got a plan that they’ve thought about long before they retired. They’ve got a social support system in place and are ready for it and they do very well. They never turn back to law enforcement. I think often, though, they don’t have a plan. They don’t respect the degree to which they’ve signed off on this idea that police officers are who they are and you see officers really struggling with trying to find meaning and purpose in their life after they’re no longer police officers. And whether retirees kill themselves at an even higher rate, I don’t know that the research supports that. But I certainly anecdotally have seen it often where officers are really, really struggling. So that’s why we turn back to wellness in general and earlier in their career, I try to disabuse officers of the idea that that’s who they are; police officers. I think that is dangerous and that’s when you have especially newer officers starting to socialize exclusively with other officers and there’s a whole kind of philosophy about that and that’s dangerous. So, you are a police officer, it’s a fantastic career, it’s very rewarding, but you’re much more than just a police officer. You need to remember that and you need to develop those other parts of who you are. Tim Gilmartin talks about wellness and emotional survival for law enforcement. He talks about the “used-to’s”, the idea that officers, when they’ve got 10, 15 years on, often say, “I used to do a lot of fishing or bowling, I used to travel, I used to go out with my friends.” And, somewhere along the line, they stopped doing that. All they are now is a cop, and that’s where we get into the dangerous narrowing of their existence or the way they feel about their life. And so, again it turned out that education and training has come a long way in terms of breaking through those unhealthy parts of police culture. GABRIEL NATHAN: I’m really glad that you mentioned the used-to’s. I was at a training run by Sean Riley from Safe Call Now and he came and he did a great exercise where officers interviewed each other about interests that they had, like around the time they were in high school. And you could watch these officers’ eyes light up when they talked about how they used to enjoy playing the guitar and playing soccer or just being with people. You could literally watch these officers remembering themselves. JEFF SHANNON: That’s sounds awesome. That’s absolutely a great exercise and I would want officers to get back in touch with that. GABRIEL NATHAN: It seems to me that mental health workers and law enforcement officers are constantly trying to disabuse people of the notion that individuals with mental illness are somehow more dangerous than the general public. I feel like in every article you read about mental health, there’s someone saying that; folks with mental illness are no more dangerous than anyone else. Can you talk a little bit about where that idea comes from? Does that come from, in your opinion, does that come from the media? Does it come from films and television? And how do we, aside from just repeating that phrase over and over again, how do we help people understand that? JEFF SHANNON: Yeah, the media definitely – when they have these school shootings or mass murders, that’s certainly perpetuated in the media, no doubt about that. The problem is that we learn about people who are mentally ill and violent when they do something that makes the headlines. 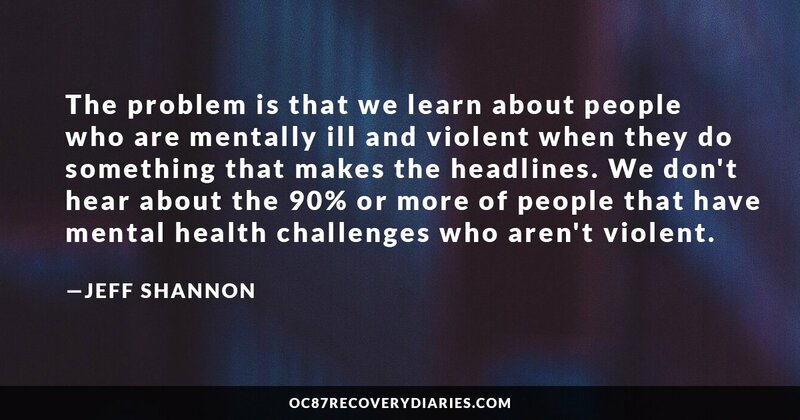 We don’t hear about the 90% or more of people that have mental health challenges who aren’t violent. So, we know that the American people believe that people with mental health challenges are more violent. The research doesn’t need to support that. However, there are some important signals here. We know that, if you’re not getting any treatment, and about 3 or 4% of the people in this country suffer from serious and persistent mental illness, and about half of them and about half of them don’t get any treatment at all. Now, if you don’t get any treatment for schizophrenia, then you’ll get symptomatic and you’re going to be out in the community and people are going to call the police because this person is talking to himself, or whatever. So then you have law enforcement called to see if somebody is not participating in treatment and that’s when you have bad outcomes. So, if you don’t get any treatment, you are more likely to become violent. That’s my opinion. If you are paranoid, I believe there is a correlation between paranoia and violence and so if you’re high, you’re more likely to be violent and there is a high co-morbidity between mental illness and substance abuse. So there’s an important footnote there that I try to teach when training cops. Now, the typical police officer stopping someone with mental health challenges doesn’t know any of that stuff generally. They don’t know if they’re taking their medication. They don’t know if they’re high. When it comes right down to it in training, the message is that use your officer safety skills, just like anyone else and look out for these symptoms. If you’re talking to someone and in the training, they learn to recognize what a persecutory delusion is although they might not call it that, if you recognize this person having delusion that they’re being pursued by the CIA, then a red flag should go up. But that doesn’t mean that you should freak out and call for everyone in the city to come back you up. But it does mean that you should note that this person is struggling and that’s a dangerous psychiatric symptom. GABRIEL NATHAN: Right, and that you are an authority figure in uniform and that they may very well turn on you. JEFF SHANNON: Absolutely. For some people, the symbol of the law enforcement uniform has very bad connotation, but for other people, you get out of the police car and they see that you’re a police officer, they feel reassured and they feel more safe. So, we don’t know, that’s part of what goes into the de-escalation piece is when you get out of your car and you’re walking up to someone, you don’t know how they perceive you as a symbol. GABRIEL NATHAN: So many instances that are reported in the media about law enforcement contacts with individuals with mental illness are, of course, if it bleeds, it leads. And so, a lot of these stories that we hear nationwide are encounters with police officers and individuals with mental illness that go bad where an officer has to use force and sometimes deadly force. And invariably, there are these comments of, “Why did the officer have to do that? The individual only had a knife and the officer has a gun. Couldn’t the officer shoot the knife out of the guy’s hand?” I mean I’m sure you’ve heard it all and read it all. Can you talk for a little bit, I mean without necessarily going into specifics, of situations where officers are confronting an individual who clearly has a mental health challenge but they’re armed in some way and what the officer’s options are and – in a given situation like that and how even with CIT training, there still can be negative outcomes. JEFF SHANNON: Yeah, thank you for pointing that out. That’s something that I say at every training I do. There is a misperception among the public that when these things happen is, “This wouldn’t have happened if these officers were trained.” And that’s incorrect. Training is great, and the industry of law enforcement’s heavy into training. The CIT training particularly is great, but there’s no way that all the training in the world’s not going to prevent bad outcomes. They’re going to happen. There are certain times when de-escalating someone is not appropriate; you wouldn’t even want to try it. You have someone coming out of a car with a handgun pointing in your direction. You want to handle your business; you don’t want to try to de-escalate that person. And also, de-escalation doesn’t always work. You can try to use de-escalation skills and sometimes they work and sometimes they don’t. Why? Because it’s not an exact science. We’re talking about human behavior and psychology in its early area. We know certain de-escalation tactics and they work, they generally work. So, I think an ideal response is for someone that we contacted has, let’s say a knife. A couple of things we want to try, if possible. We want to slow down the situation. It’s not always possible. There’s a window of opportunity to use de-escalation. We know that well over 90% of all interactions we have, we can resolve them without the use of any physical force. So, we want to try and slow down if possible and we’ve seen officers get in trouble, myself included by the way, rushing into situations unnecessarily. So, slow down, get as much information as possible — if possible. Now, there’s, again, many situations where you just don’t have time, but, if possible, get as much information as possible about what happened. That means talking to the wife standing out in front of the house, talking to the friend who’s standing nearby. Say, “Hey, what’s going on with Johnny over there?” Get as much information as possible before acting. Get all the resources there that you need if possible. Get less lethal there, get whatever you need to safely resolve the situation. And then, if possible, you want to try to establish rapport with this person. You can establish rapport with someone very quickly if you say and do the right thing, if you use body language a certain way. Sometimes, you can establish rapport. GABRIEL NATHAN: That’s great. And I think that’s really important for people to know, that there are options. There are tactics, but like you said, it doesn’t always work. My next question to you is, “When it does work and you’re able to de-escalate someone, you’re able to take the knife away, you’re able to not arrest them but place them in protective custody. Where do they go?” Where you work in Berkeley, is there a facility that is designed for, you know, 24 hour involuntary admissions? What’s the bed capacity and if that’s full, then where do they go? JEFF SHANNON: In Alameda County, we’re actually quite fortunate to have a locked psychiatric inpatient facility. As you probably know, there’s many places across the country where, if they’re going to put someone on a psychiatric hold, they have to drive to the next county. We’re lucky in that way. Now, I’m tempted to get into the whole issue of the mental health system. I think it isn’t fair to ask our police officers to be doorkeepers at least for the mental health system and what we’ve seen in the last 50 years is that funding for community mental health has gone down. It started with John Kennedy and closing all the state mental hospitals in an attempt to be more compassionate toward people with mental illness to get them out of the state hospitals where their family would have to drive 200 miles to see them kind of languishing in these mental hospitals. The Community Mental Health Act signed into law included the promise of funding for Community Mental Health Services to get these people out of the state mental hospitals into the communities where they live and treat them there. The problem was that the funding never really came. And so, at the same time you’ve got these state mental hospitals closing, you have a lack of funding and these people wound up on the street. In California, this situation was accelerated by legislation that hastened the rate of closures of our state hospitals. So now you have people who are very, very sick on our streets and no infrastructure or an inadequate infrastructure to treat them. And so now, police officers are left holding the bag. We’re now expected to be social workers and health clinicians, and so that part has gotten us to this position. To get back to your question, I’m sorry for the digression. The reality of the situation practically is that many people that go to the hospital just like hospitals across the country, get very little in the way of treatment. They get an interview with the doctor for 10, 15 minutes, the doctor makes the decision about whether the person is admitted or the hold is lifted. So, only about 25% of the people that go to the hospital are admitted. What does that mean? That means that 75% of the people that we place on a hold are released within 24 hours. And so, the frustration level of the officers is very high. Officers will say, “I placed this guy on a psychiatric hold and before I’m even done really clearing the call, I’m still on the paperwork, I seen him walk out of the hospital.” So, it’s frustrating. The hospital is understaffed, they’re overwhelmed. In California, Alameda County where I work, we believe we have probably more involuntary psychiatric holds than any other county in the state. And so, it’s just – if you look at it, an analogy would be the community psychiatric facility is an eight-ounce glass, it holds eight ounces of water and we take a pitcher and pour that water over the glass so there’s water coming out over the sides. GABRIEL NATHAN: So, that’s an admittedly a bleak picture. Is there a ray of sunshine anywhere? Do we increase the size of that glass? Do we create more glasses because the pitcher obviously isn’t getting any smaller. How do we get your officers help dealing with this? What is the answer or is there one? JEFF SHANNON: I think there definitely is an answer. In terms of funding, we spend disproportionate amounts of our funding on mental health on inpatient locked facilities and so, it’s just like everything else in life, it comes down to dollars and cents. It also comes down to the stigma like we talked about earlier. The ray of sunshine’s going to come when people across the country say, “This is absolutely unacceptable what’s happening.” We’re seeing people completely psychiatrically de-compensated on our streets suffering, languishing, worse than they languished in a state mental hospital and that is unacceptable.” It’s not until that happens that you’re going to have a solution. So, when that happens, when enough people say, “This is unacceptable,” we’re going to decide we’re going to spend more money funding community mental health. That’s when it’s going to change. When people get fed up enough, we demand that this community mental health system which is a whole kind of spectrum of services that starts with relapse prevention, education, getting family members that have someone with a mental illness in their family, all the information they need to know how to help manage their child’s mental illness. It needs to be all funded fully so that we can get people the treatment they need. Really, they need it before they get sick. GABRIEL NATHAN: Yeah, and I think that’s also the key too with an issue that we were speaking about earlier on which is officer mental health. It’s early intervention. There are so many steps that can be taken before we get to that point of suicidal ideation or before we get to the point of, well now we’re talking inpatient hospitalization, involuntary for you. It’s how can we address this early? Well, there’s a problem but it’s not a burning problem. JEFF SHANNON: Yeah, I think that’s exactly right. You know, I change the name of my class from stress management sometimes and go to wellness because that’s where I want the emphasis to be for my classes. There’s a science now about how to take care of ourselves. The question used to be, “How do I get through to the finish line, across the finish line so I can go fishing?” And what I want to do, and many others want to do is move the conversation to – the goal is to survive this career. 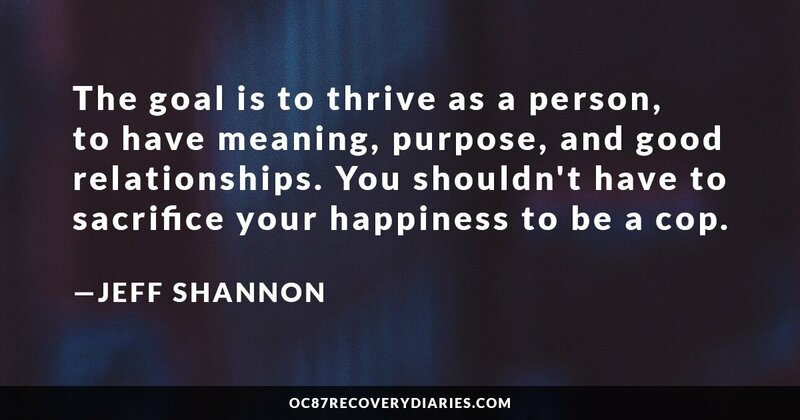 The goal is to thrive as a person, to have meaning, purpose, and good relationships. You shouldn’t have to sacrifice your happiness to be a cop. You should be able to live a fully expressed life like anyone else and the good news here is that there’s a whole science about how we can take care of ourselves and make that happen. Positive Psychology, for example, is not without its controversy about the quality of the research they’re producing. But I’ve looked at a lot of the research and I think it’s quite good. It talks about things like developing gratitude. Now, it’s an interesting conversation depending on where you are in the country to bring up something like gratitude. It sounds very hippie at Berkeley, but the thing is, there’s the research telling that if we develop gratitude, we can change the very structure of neuro-connections in our brain to start scanning the environment, not for negative, but for positive. And we can change the very way see the world, so that’s the message that I give all the time. You have to work at your wellness. So, for example, there’s some research that suggests that if you – at the end of every day think about three good things that happened to you that day, that if you do that over a period of time, your happiness quotient for lack of a better term will go up. There’s mindfulness training, being able to use breathing. Breathing is a tool that every officer has on their belt and some don’t use it. So breathing is a way to calm yourself down, physiologically, right in the moment, free of charge. Mindfulness, breathing, gratitude, all these things, social support, developing your social support, these are protective factors. They’re protective factors and they add to our joy and happiness of a career. GABRIEL NATHAN: Well, Jeff, I can’t thank you enough for this interview—it was definitely one good thing that happened to me today! JEFF SHANNON: Thank you. I’m glad. GABRIEL NATHAN: Thank you, it was really a pleasure, Jeff. Gabe is an author, editor, actor, playwright, director and a lover of commas. For five years, he worked at Montgomery County Emergency Service, Inc. (MCES), a non-profit crisis psychiatric hospital in the capacity of Allied Therapist and, later, as Development Specialist. At MCES, he created innovative programs such as a psychiatric visiting nurse program, a suicide prevention collaboration with SEPTA, and an Inpatient Concert Series that brought professional performing artists to entertain the patients and enrich their inpatient experience. While at MCES, Gabe also produced and directed a full-scale production of Thornton Wilder’s Our Town with the staff of the hospital, as an exercise in teamwork, empathy-building, and creative expression. Gabe serves on the Board of Directors of the Thornton Wilder Society and is Editor of its newsletter. He lives in a suburb of Philadelphia with his wife, twins and a basset hound named Tennessee. We shine the spotlight on the individuals who help folks along on that road of recovery including mental health professionals, like Christa Godillot, RN.